These Cream Cheese Tarts with Fruit are easy and quick to make using store-purchased pastry shells. Of course, you can use your own yummy homemade pastry instead if you wish! Fruit and cream over a layer of semi-sweet chocolate, these tantalizing tarts are amazing! Our daughter, Karissa, loves to bake, for which I am thankful! 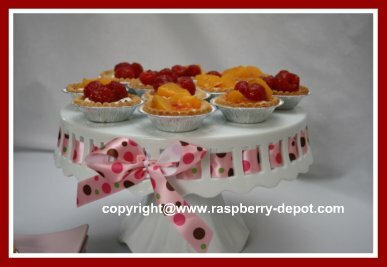 This past Saturday she made these lovely, fresh, scrumptiously delicious fruit tarts! 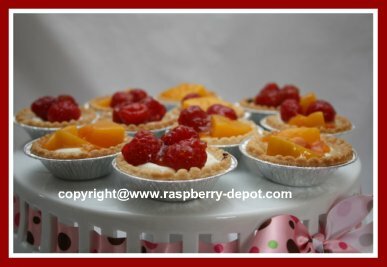 They are made using peaches and raspberries, however you can use any fresh fruit to make an assortment of delicious fruit tarts! 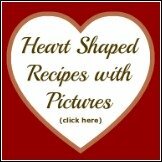 (The peaches my daughter used for this recipe were actually canned peaches). 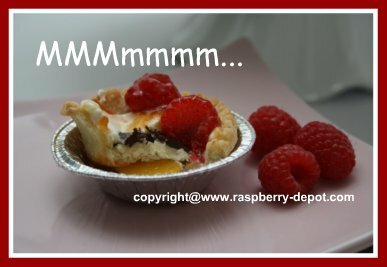 We had family over on Sunday, and all the tarts are now gone ... so ... you know they tasted like "more"! Thanks Karissa, and thanks for taking the pics for me! 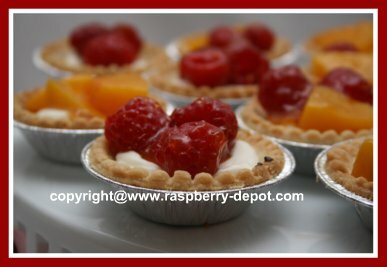 Scroll down for pictures of how to make these fruit tarts with cream cheese filling. In a microwave, on low heat, melt the butter and the chocolate chips, stirring often, until melted and smooth. Spoon the chocolate mixture into the bottom of the tart shells. 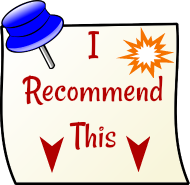 In a bowl, beat, using an electric mixer, the softened cream cheese, granulated sugar, and the sour cream, until smooth and well combined, about 5 minutes. Add the vanilla extract and beat again until combined. 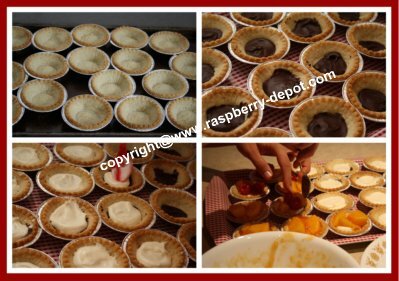 Spoon the cream cheese mixture over the chocolate in the tart shells. 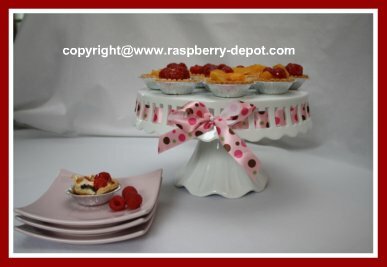 Do you like presenting your baked goods on a beautiful cake and pastry stand like the one shown in these pictures? 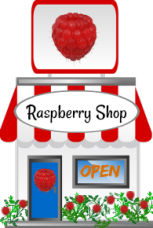 Place the raspberries, (or other fruit), (make sure large fruit is sliced), in a bowl, and drizzle with the jelly preserves. 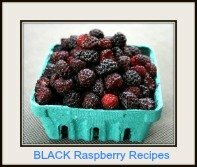 Toss gently, just to coat, or mix lightly with a small rubber spatula. Spoon the fruit mixture over the cream cheese mixture in the tart shells. This recipe makes about 24 Delcious Cream Cheese Tarts with Fruit! Good to the Last Crumb!